Providence was at the top of my L.A. restaurant dream list. Even before the amuse bouche hit my lips, I knew I would love Providence. It was everything I loved in a restaurant--intimate setting, impeccable service, amazing fresh seafood, talented pastry chef...of course, the restaurant's two Michelin stars also made me that much more excited. 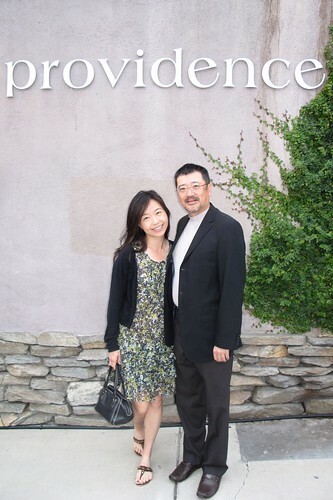 Two things happened in June: 1) my sophomore year at UCLA came to an end and my parents were in town to help me move out of the dorms and 2) Providence was having their 5-year anniversary special of 5 courses for $65. It was meant to be. I would finally be able to enjoy at meal at Providence. 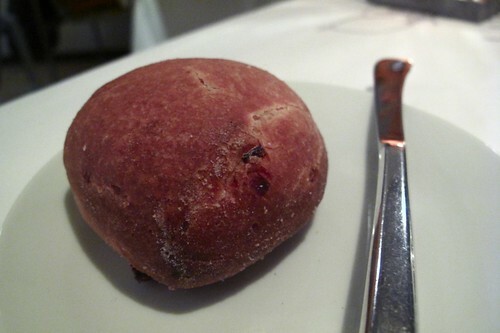 The bacon brioche had the delicious smokiness of bacon, but the texture was a little too fluffy for me. I enjoyed the plain white roll a lot more. It had a nice crusty crust and a chewy, yeasty center. A piece of the bread, smeared with butter, and a sprinkling of sea salt (served with that adorable miniature scoop) and I'm a happy girl. 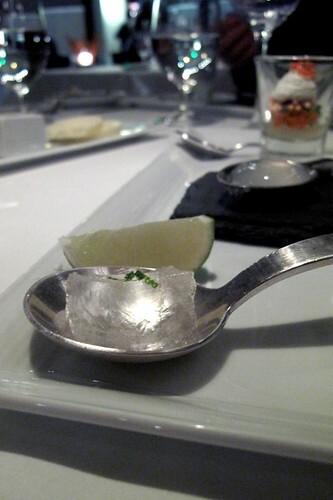 The gelée tasted exactly like a gin and tonic and was delicious with a squeeze of lime. 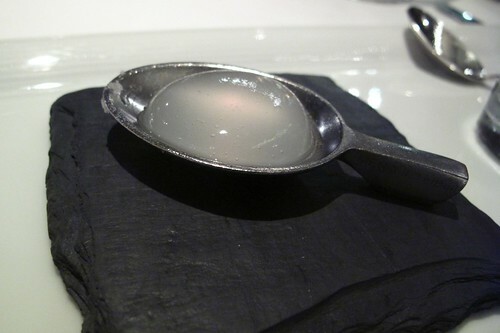 The margarita spherification also tasted exactly like a margarita, complete with a spoon rimmed with coarse salt. 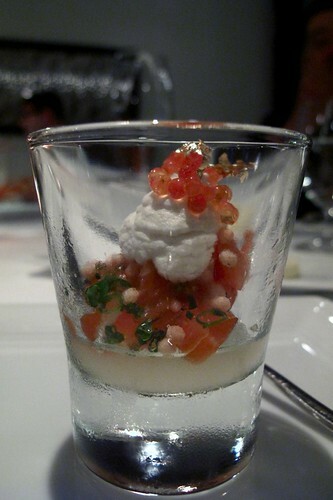 The ocean trout served in a shot glass was the best bite of the bunch. The trout was deliciously fresh and the lemon jelly sweetly acidic. Digging a spoon straight down into the shot glass resulted in a bite of a delectable combination of salty, sweet, and acidic with the texture of raw fish interspersed with crunchy bits of toasted rice balls and salty bursts of fish roe. Who knew sashimi could taste so good? First of all, the fish was incredibly fresh--with a deliciously supple texture and literally the essence of freshness and of the sea. The soy crème fraîche with the raw fish was a revelation. 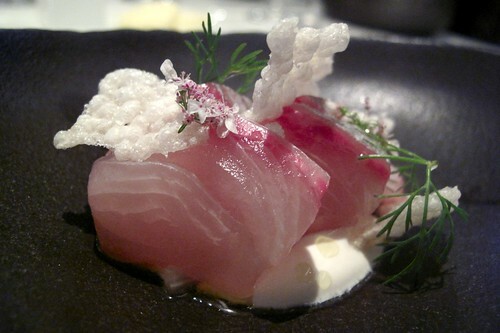 Slightly creamy, it elevated the mouthfeel of the kanpachi to a whole new level. The rice crackers not only provided a nice contrast in texture, but also had the flavor of toasted rice. Perfectly cooked scallop--beautifully caramelized, yet still slightly rare and translucent in the middle, it was sweet and succulent. The flavors in this dish reminded me of India and curry--probably as a result of the vadouvan. I also enjoyed the scattering of toasted cashew pieces and the flavor of mint throughout the dish. 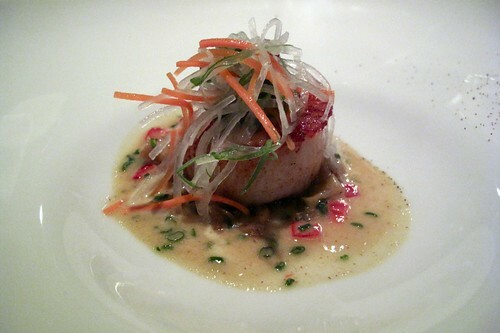 Although it was only one scallop, it was extremely satisfying. This was the one supplement we added to our 5 course tasting menu and we shared one order between the three of us. I cannot resist freshly made pasta. Nor can I resist sea urchin and spot prawns. Obviously we had to have this. It was a nice addition to our meal. 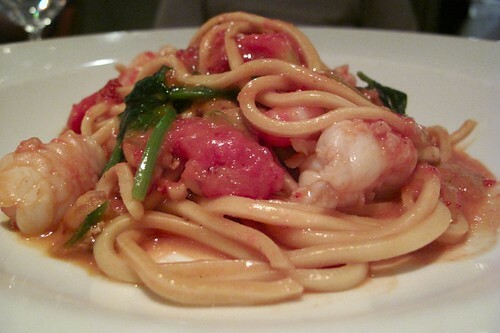 The al dente pasta was swimming in a luxuriously rich sauce made from sea urchin and spot prawn heads and eggs. Occasionally we would stumble across a piece of pea tendril and we'd get a little bit of vegetal sweetness. There were still intact piece of uni mingling with the pasta and the spot prawns were so sweet and snappy. I enjoyed this halibut a lot, but my parents were a little less impressed. I think it's because we were served the rich pasta before this lighter course came out. I would've flipped the two dishes around. 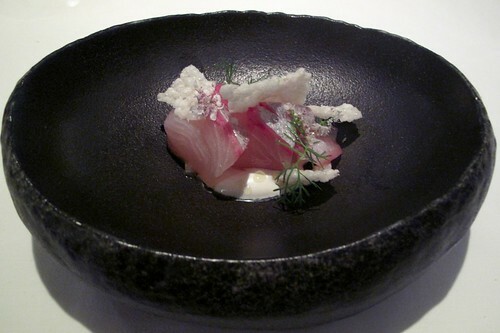 However, I do think this was a remarkable preparation of a normally dry and boring white fish. 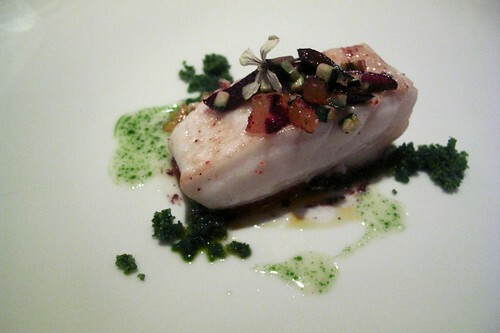 I would never voluntarily order halibut if I had other fish options, but this halibut was great. Barely cooked through, it was tender and moist with interesting accompaniments. The apricot, black olive and zucchini relish on top was slightly sweet, as well as the tomato compote underneath. The basil bread crumbs in combination with the spring onions, basil butter sauce gave the entire dish a decidedly Italian, yet innovative flavor profile. 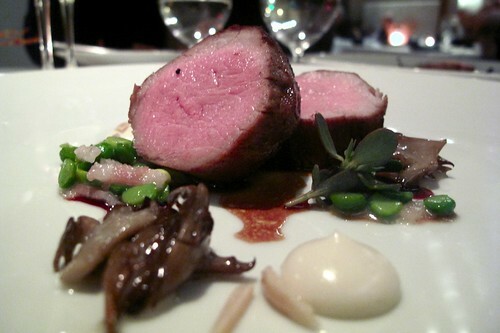 Veal is another protein that, give other options, I would not necessarily gravitate towards. I tend to think of veal as slightly boring in taste and texture. This veal, however, changed my mind completely. Cooked for two hours at 140 degrees, it was pleasingly tender. The bacon added a smokey aspect to the dish, and the maitake a deep, earthy, "umami" complement. The double shelled sweet peas were not only a perfect example of the level of intricacy in Providence's dishes, but also a fresh counterpoint to the more robust flavors in the dish. The dollops of the slightly sweet almond milk confused us in a good way, and the blanched almond slivers were at that delightful point between crunchy and less crunchy from being in sauce. The green herb, apparently, was pruslane--an herb I had never tasted nor heard of before. Overall, an interesting dish that caused us to really question and evaluate the flavors we were tasting. Finally, we were at dessert. I had high expectations of Adrian Vasquez's creations and he did not disappoint. I loved this dessert. 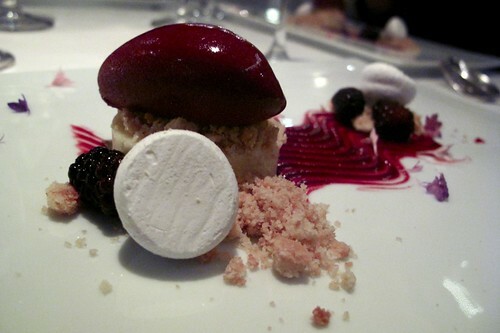 It was perfect--from the delightfully tart yuzu curd, to the fragrant jasmine blackberry sorbet and buttery streusel crumbs. The only thing I found to be a little boring were the meringues. They didn't provide too much of a textural enhancement, nor did they offer anything in terms of flavor. However, I still enjoyed them because I can never say no to meringues. 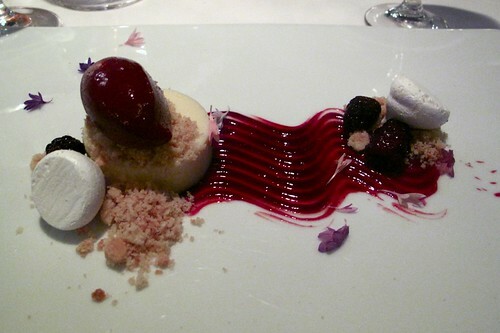 I thought the clean, bright-tasting flavors of this dessert was the perfect closing to a wonderful meal. 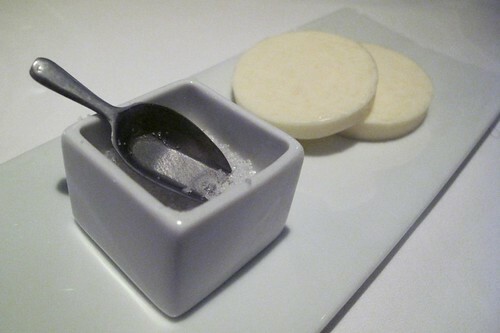 I was less impressed by Providence's selection of mignardises. I thought Sona put out a much more innovative and delicious offering. The chocolate marzipan were alright and tasted exactly how you would expect them to. The banana caramel were nothing special and the nougat actually tasted a little weird to me. 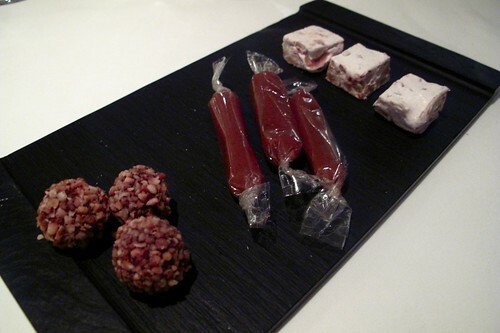 Still, I always get a little excited by mignardises. In all honesty, Providence was the best meal I've had in L.A. so far this year. It was simple, yet complex. Each dish was intricately prepared and had us scratching our heads trying to figure out what exactly it was we were tasting, however, the freshness of the ingredients and their inherent flavors still shined through. I had been scared that my palate had become jaded, that nothing could really make me have that eye-widening moment of "mmmm," but Providence reassured me that there are still delicious and impressive meals out there waiting to be had. *We also had the wine pairing with the tasting menu, and it was one of the best pairings I've had to date. The wines and the dishes complemented each other so well. I chose not to include it in my review because 1) I didn't get great pictures of the wines and 2) I'm a lot less skilled in my descriptions of wines...but I'm working on it :) Basically, what I'm trying to say is, get the wine pairing! Nice post! We even ordered the same supplement! LOL. Also, great pics, those turned out way better than mine. great pics! i need to go back to providence again - i'm glad it's still around and still cranking out great stuff. 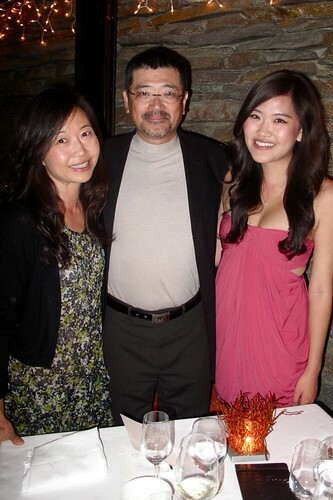 great lookin' family too! last time i took pictures at providence it was so dark it looked like I was eating earth :D.
But this post was so...serious. nice! it's so great you get to enjoy these kinds of meals with your parents... my parents tend to pick apart restaurants/meals like this (price not worth the portions, etc etc) and it makes the experience not as fun. Joan, your parents sound like my parents! I could never take them to a place like Providence. Even if they could get past the price, the food would just go way over their heads. Christina, good to see that there are still some places that can impress. 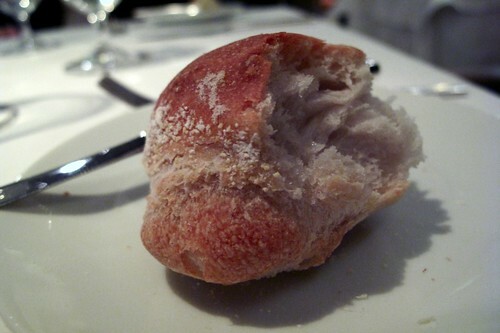 You do need to do the 16-course Chef's Menu sometime though--that blew me away last time. LOVE the seafood pasta! Glad you ordered that supplement. And I agree - that veal is a fantastic preparation. 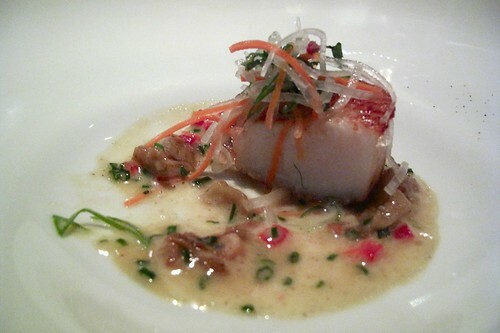 One of the most memorable dishes...from a seafood restaurant. christina, great post! I have RSVP this Friday for their anniversary menu.. and Kevin's right.. you have to try their Full Chef's Menu.. it is just.. fabulous! @Kung Food Panda: yeah that was a good supplement :) tasty! 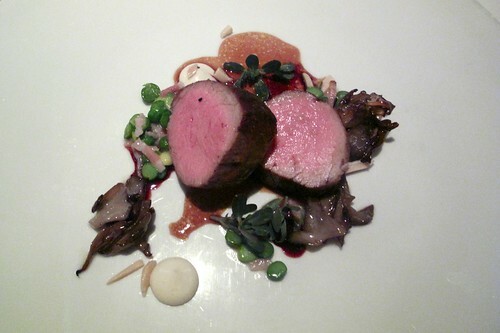 Next time try the Wagyu beef, its Providence's one redeeming course in my eyes.